Recent conversations have alerted me to two titles from Hakusensha’s LaLa line that I’d love to see licensed, as they’re by creators who already have very appealing work available in English. 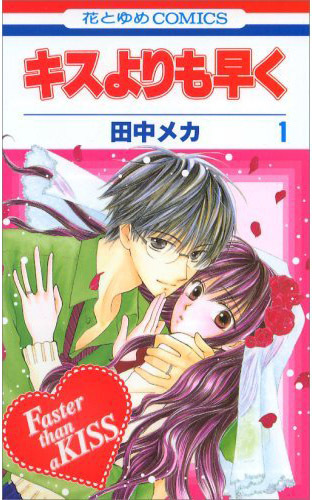 First up is Yoroshiku Master, written and illustrated by Sakura Tsukuba. Tsukuba is the creator of the very charming Land of the Blindfolded and the very funny Penguin Revolution, both from the LaLa line and published in English by CMX. Beyond Tsukuba’s credentials, Yoroshiku Master has the additional advantage of focusing on Japan’s endearingly fluid take on the Christmas holiday. It’s about a young girl who is suddenly thrust into the role of Santa Claus, accompanied by a young boy who turns into a reindeer and calls the girl “Master.” It may be a little too soon after Snow-a-thon 2010 to start thinking about stories built around a winter holiday, but this series sounds too endearingly bizarre to wait. Plus, if someone starts working on the license now, perhaps we could have it in our hands by November when we’re in more of a mood for it. Click here to view some preview pages of the first volume. Next is Faster than a Kiss, written and illustrated by Meca Tanaka. Tanaka, one of a tiny handful of male shôjo creators to be published in English, if not the only one to date, is responsible for Omukae Desu (another LaLa title from CMX) and Pearl Pink (a LaLa title from Tokyopop, just to mix it up a bit). I like the quirky sense of humor and low-key sentiment that Tanaka brings to his work. Faster’s premise is a little worrying for those of us who have been burned before by “hot for teacher” subplots in our shôjo, but I’ve been reassured that Tanaka’s take isn’t icky in the slightest. The comic is about a pair of orphans who are shuttling from unwilling relative to unwilling relative. The sister contemplates dropping out of school to provide for her brother. When her teacher tries to dissuade her, she says she’ll stay in school if he marries her. She’s kidding, but he agrees, and the secret-relationship shenanigans commence. Click here to view some preview pages from the first volume. Neither of these titles is likely to blaze new and innovative trails in the shôjo category, but both creators have a track record for charming work, and that’s good enough for me. This entry was posted on Friday, April 9th, 2010 at 5:39 am and is filed under License requests, Linkblogging. You can follow any responses to this entry through the RSS 2.0 feed. Both comments and pings are currently closed. I would pre-order all of Faster Than A Kiss SO FAST it would make your head spin. Seriously, I normally hate hate hate the dubious teacher/student relationships* but I’ve read some chapters via scans and he manages to make it silly and crack-y and somehow *adorable*. The baby brother probably makes the series. Speaking of Hakusensha, though, a friend of mine passed me a volume of Full House Kiss, which is based on an otome game, and I was surprised by how much it charmed me. Nothing ground-breaking, but very enjoyable. I’d also kind of like to play the game now. Gia: No, it is indeed a source of shame! I was trying to sift through all of the popular/critically appreciated licensed titles and clearly had some giant blind spot for missing that one. Meca Tanaka also has a 4-volume-complete series that is very enjoyable read called “Sailor Fuku ni Onegai!” It would be great to see it get licensed, too. Badzphoto: I’m of the “more the merrier” school as far as Tanaka goes. Thanks for the pointer! Both wonderful selections. I’ve “read” (looked at the pictures, tried to puzzle out the words, got annoyed and looked online for a summary) of Faster than a Kiss. I’d be right behind the other poster in pre-ordering it. Hakusensha OWNS me. That winking, pink-haired lady sits at the top of a LOT of books on my wall of shelves, and I know she’s hiding under the US trade dress of many, many books that I love. – Akuma to Dolce, about a sweets-loving demon by Karakuri Odette’s Juliette Suziki (TP even promotes this connection on the back of KO, so it gives me *hopes* they got that one as well). – I want some Miyki Yamaguchi. The sweet, fairy-tale-ish stories would fit in well with CMX’s current lineup. – Kochi Ouji, but I don’t see anyone at this point taking up a 25-volume series by a mangaka that’s not been published here yet.